West Covina High School softball coach Jesse Mendez, a catalyst in keeping the San Gabriel Valley all-star softball game alive the past couple years, worked with San Gabriel Valley coaches with help from our sports team of reporters at the SGVN to create the inaugural San Gabriel Valley/Pasadena Star-News/Whittier Daily News senior all-star AND Underclassmen game on Sunday, June 7, at the University of La Verne’s state of art softball complex. The underclassmen game is at 3 p.m., followed by the senior game at 5:30 p.m. 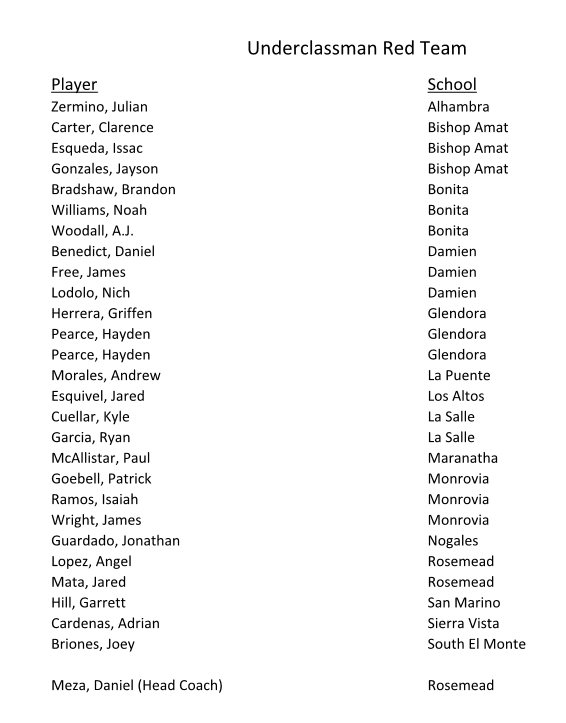 Similar to the annual Tribune/Star-News All-Star basketball games, players were selected from the SGVN readership, pitting the Tribune vs. the Star-News/Whittier Daily News All-Stars a day after the June 5-6 CIF softball championships. Rosters have been selected and posted below. Coaches for the Whittier/Star-News teams are still being determined. For more information on the game, Pasadena based players should contact keith.lair@langnews.com and Whittier based players should contact steve.ramirez@langnews.com. To reach tournament director JESSE MENDEZ, EMAIL HIM AT californiadiamonds@yahoo.com. You can also reach fred.robledo@sgvn.com for questions. 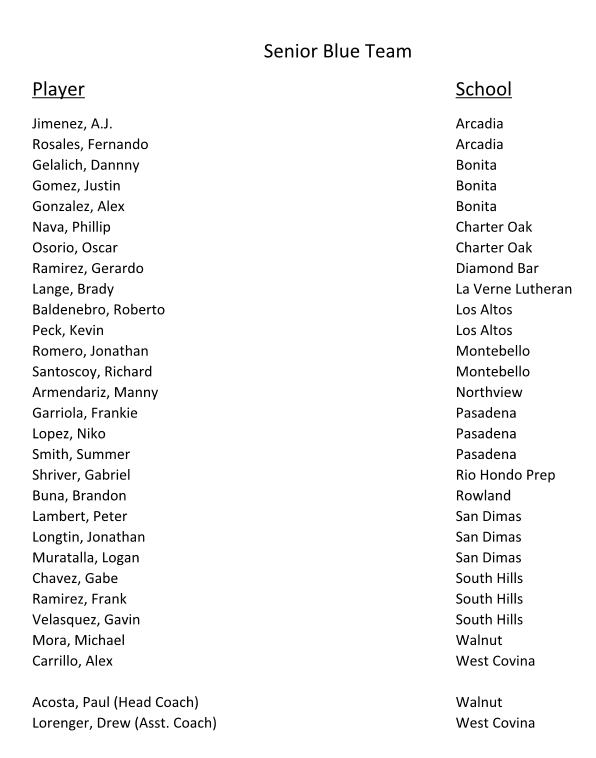 Coaches: Jesse Mendez (West Covina); Nacho Hernandez (Los Altos); Brandon Gonzales (South Hills). Rain Vega, La Mirada, Jr.
Dominique Mejia, La Serna, So. 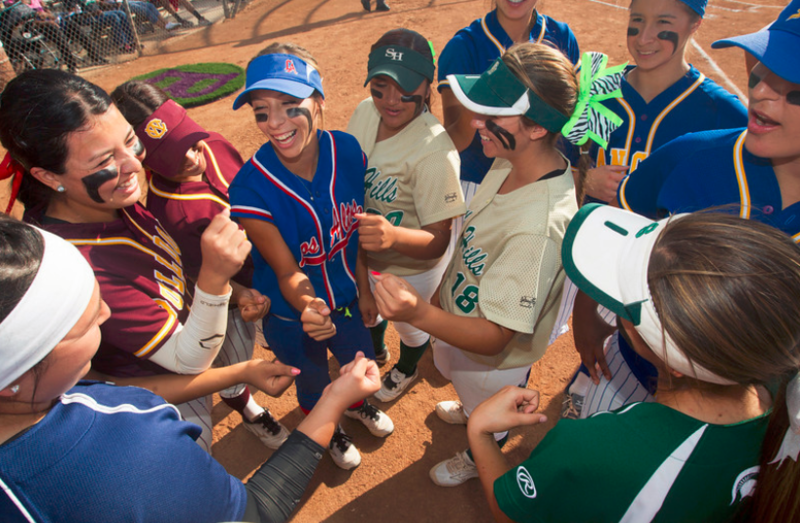 Angelica Lopez, La Serna, Jr.
Sydney Kriemann, St. Paul, Jr.
Nikki Butler, La Habra, Jr.
Janelle Rodriguez, La Habra, So. Kristie Carbajal, Santa Fe, Jr.
Morgan Ryan, Whittier Christian, Jr.
Chaminade boys basketball coach Todd Wolfson has left the West Hills campus and has taken the same position at St. Francis in La Canada. Wolfson spent seven successful seasons at Chaminade, leading the Eagles to a CIF Division III state championship in 2014. Wolfson was 142-48 over seven seasons and was named Cal Hi Sports coach of the year in 2014 as well as Daily News Coach of the Year. Wolfson led Chaminade to a Southern Section championship game appearance in 2009 and was the division coach of the year despite losing to perennial power Price in the finals. Wolfson has also had tremendous success moving players to the next level. 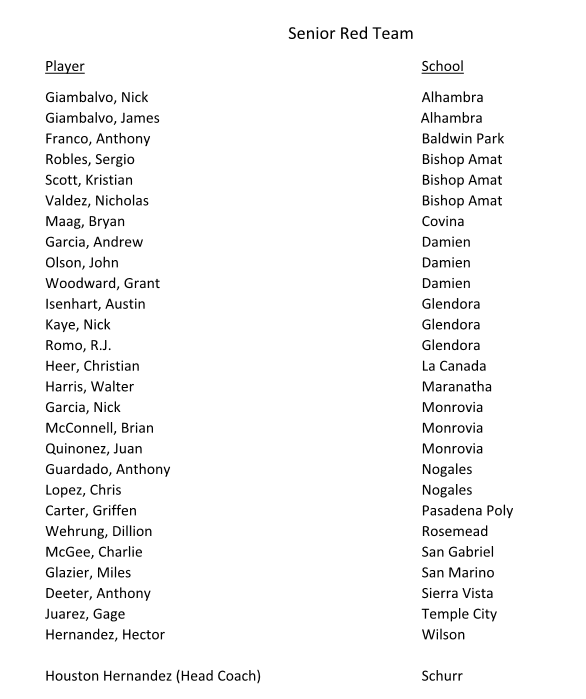 Wolfson was instrumental in helping the following players move on: Jules Montgomery (Prairie View A&M), Jamal McClerkin (Metro St.), Gilles Dierickx (Washington), Jaron Martin (UC Irvine), Jack Williams (Pacific) and Michael Oguine (Montana). 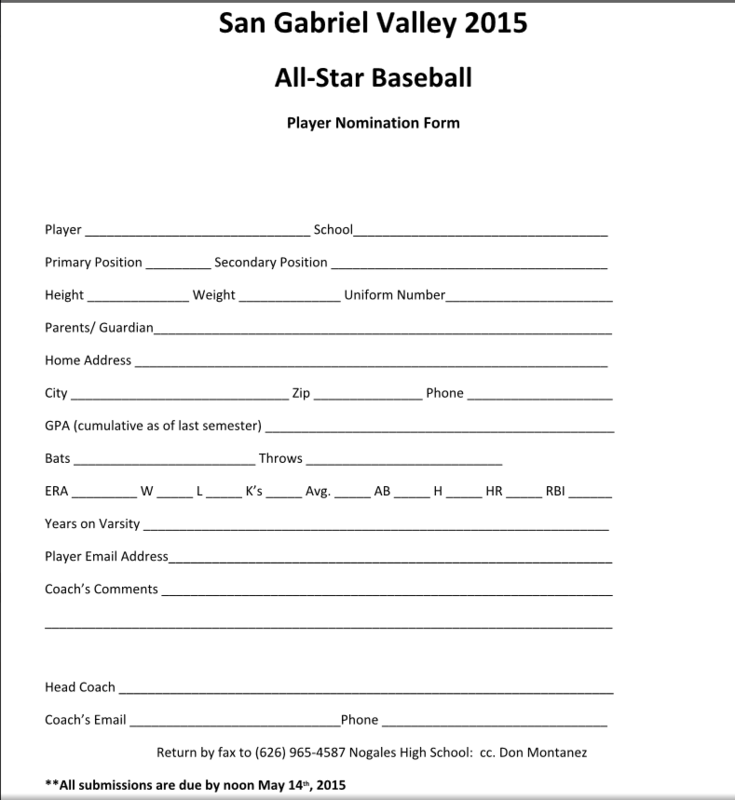 BLUE-RED-GAME: Coaches in the East and West San Gabriel Valley need to contact Nogales baseball coach and all-star game organizer Don Montanez or Alhambra coach Steve Gewecke to nominate players for the San Gabriel Valley Blue-Red underclassman and senior games. 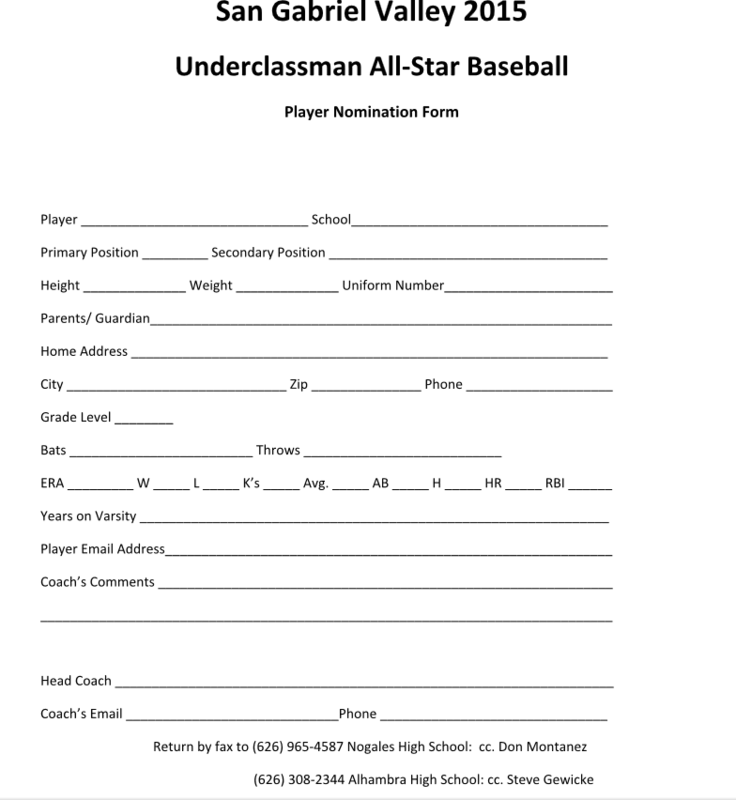 The Underclassman game will be held at Moor Field in Alhambra on June, at 2 p.m. and the Senior game will be held at East Los Angeles Community College in Monterey Park on June 8, at 7 p.m. Danny Roddy of Northview and Danny Meza of Rosemead will coach the Underclassman Game. 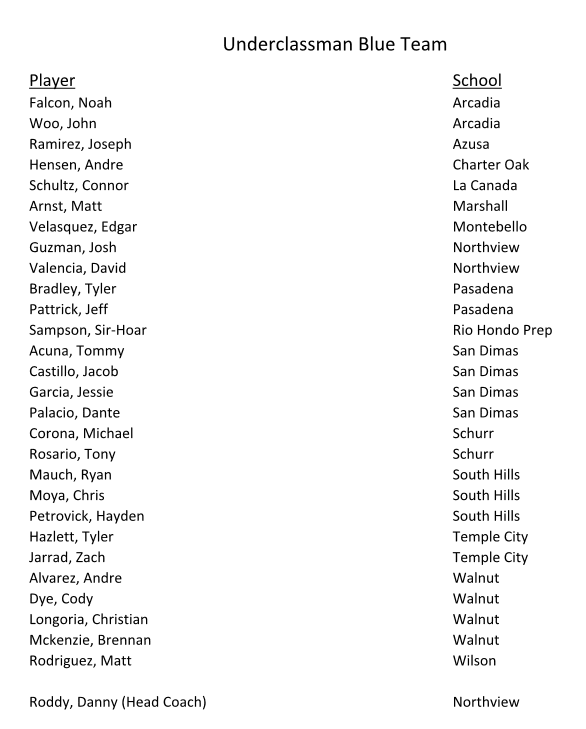 Paul Acosta of Walnut and Houston Hernandez of Schurr will coach the Senior Game.